Vivo and Oppo are related brands and they do most of the things together for example- Always you see Vivo & Oppo Ad holdings Together, Both brands use Newly Developed In-Display Fingerprint Technology in their Flagship phones. etc. Vivo and Oppo are kinda Competition for Other Major brands like Xiaomi, Motorola and others because of they use new ways of using technologies, Oppo has the first ever Motorized Camera, Vivo has In- Display Fingerprint Technology, hence they both now has the Highest Aspect ratio screens. So they are trying to do something which will attract the customers leading to increase in their demands & Sales. 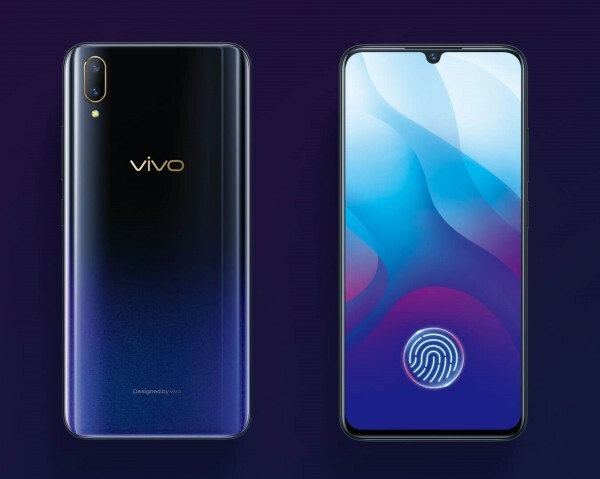 So did they in their new Vivo V11 Pro, Vivo highlighted Display Fingerprint, Camera and obviously its Design, Vivo V11 Pro has new Water Droplet type Notch which looks quite tiny and unique, this phone has Large 6.4 inch Super AMOLED display that Vivo call as “Halo Full View Display”, it has an Aspect Ratio of 19.5:9, with just a 1.76 mm border on either side of the display. If we talk about its body design, Vivo put Curves on its body which makes it easy to hold & comfortable, Talking about the big Topic the Camera, So Vivo Provided a AI dual Camera at the back which features a 12MP+ 5MP camera combination. The main camera has a large f/1.8 aperture and 1.28μm pixels. This Powerful combination Improves the Picture quality in low light. Also Vivo V11 Pro has DSLR-standard Dual-Pixel Autofocus technology which gives the fastest 0.03 seconds Focusing speed. V11Pro uses its AI for more better shots in almost every scene. It analyses pictures – identifying objects in it, elements and scenes such as ‘night’, ‘portrait’, ‘food’ or ‘flowers’, and applies specially customized enhancements. Now the Front camera is also a big thing, it has a enormous 25MP HD resolution sensor for High photo quality. Now taking about what’s good in the hood, it has the powerful octa-core accelerated Qualcomm chip, the Snapdragon 660 SoC, with 14nm design, V11 Pro has a huge 6GB of RAM, and 64GB of internal storage. Vivo has its own UI, Funtouch OS, so they installed the latest version of it (Funtouch OS 4.5) and as well as it is based on latest Android 8.1. With the Power of AI Engine, Its CPU is efficient in all scenarios. So with that Power it has a decent 3400 MAh with Fast charging by VOOC Flash Charge 5V/4A. Now mostly as other Smartphones brands are doing Vivo did the same. Vivo also has their new AI Assistant The Jovi and they Enabled it in Vivo v11 pro, the word Jovi, means “Enjoy Vivo’s AI”. Jovi learns to understand like other Assistants in the market. And Vivo Said something Laughable “Jovi learns to understand you better than you know yourself”. It can give you Event Alerts, Shortcuts, Weather and much more! Also with Jovi v11 pro has Google Assistant, which also help alot! This Smartphone also comes with a newly updated AI Game Mode with this you can literally focus on Games, this function will adds a quick sideways swipe for easy access to many actions without leaving your game. This smartphone also supports live emoji where you can create your Emoji with different characters and share to the World in the form of Video, Image, GIF. Stay tuned with Alloftop for more Unearthing on Smartphones!